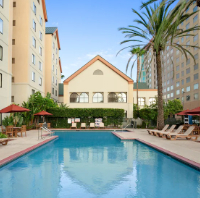 Contemporary design meets comfort and convenience at Homewood Suites by Hilton in Anaheim. Located only a mile from the Disneyland Resort main entrance, this 166-room, all-suite hotel boasts spacious accommodations and modern amenities, creating a home-away-from-home atmosphere that’s sure to please the entire family. Hotel features evening social hour, offering a light dinner with wine, beer and soft drinks. Available Mondays through Thursdays.